Worship in this year becomes so crowded that a third service was added (lasting just for two years, however). 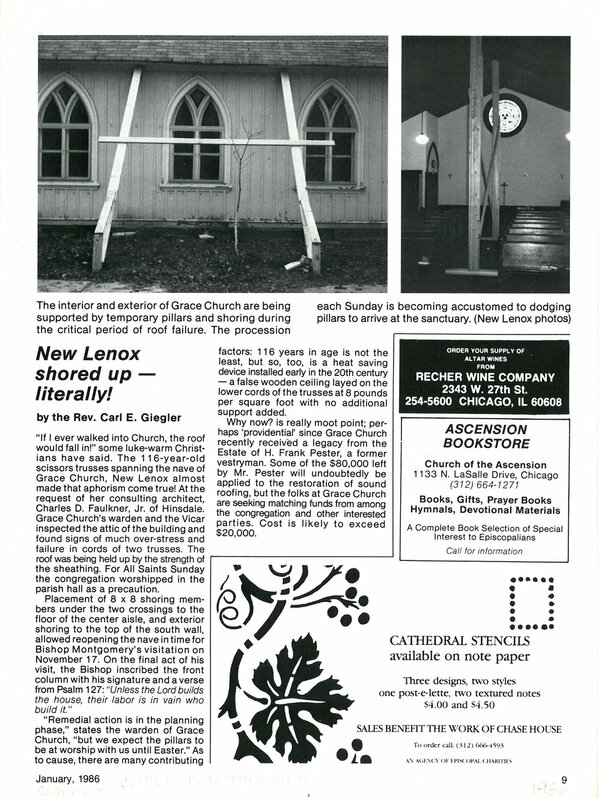 A page from an article in The Advance, a magazine for the Episcopal Diocese of Chicago at the time, which details the work to keep the church standing up after major storm damage. January 1986. Grace Church sponsors its first 10K run, a fundraiser; it includes 6.2 miles on paved roads in and around the New Lenox area. Registration is $5.00 in advance and $7.00 for late registration. Trophies were given. Tom Brunick was the chairman. One of the century-old maple trees is downed by a windstorm striking the lower south east corner of the roof in the process. There is a patch inside the church to indicate where the tree damaged the roof. The inspection of the cast bell is done by Schulmerich Carillons, Inc. The floor of the bell tower shows no adverse effects, but the cast bell stand needs to be replaced. The old clapper has a flat spot. The E.C.W. (Episcopal Church Women) have decorative plates made with the church on it in this year, five of which remain in the Vicarage and one on display for the 150th Anniversary in 2018. The price to own of each plate was $10.00 each. Excavation of the south foundation wall of the church/undercroft begins for reinforcement and waterproofing. The youth of Gracetook over the job of digging: Tom Leonhardt, Patrick Burke, Mike Webb & Rick Skolpik. The cost is about $3,000. A problem with the roofline reveals that shoring installation needs to be done to support the over-stressed scissors trusses of the church. The crossbeams no longer hold the roof together and the side walls are starting to bow out at the top. All pews are removed and scaffolding is erected in the main body of the church. The congregation worships in the parish hall for about a year. The New Lenox Minister’s Association presents a “Living Nativity” Tableau held at the Methodist Camp Ground. United Methodist, Christ’s Mission Lutheran, and Grace participated. The Altar Guild members in this year include Verna Gratrick, Doris Cooper and Mary Morris. Their new recruit for 1986 is Dorothy Cooke, who serves for another twenty years. The Couples Club changes its name to Pairs and Spares. Doris Cooper said the name change was so that singles or widows/ widowers would feel more comfortable joining the group. In this year, the rotting shakes and cross on top of the bell tower were replaced. The tower was also secured from invasion of birds & animals. 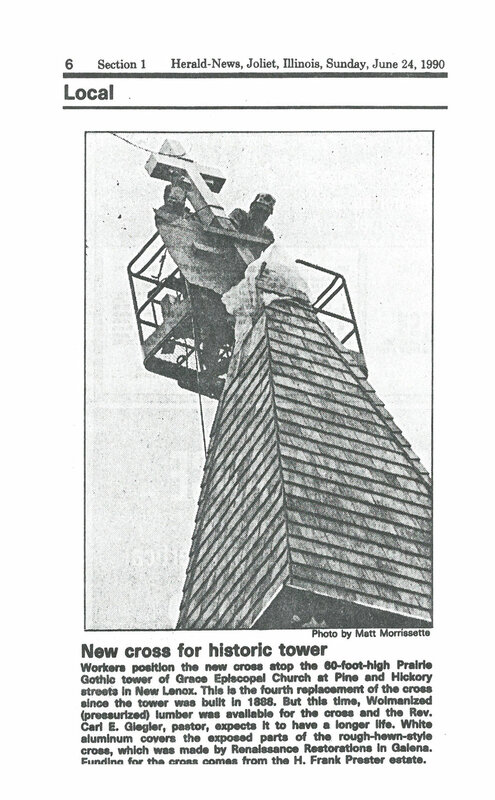 This was the fourth replacement of the cross on the 60-foot­ high bell tower. Wolmanized (pressure treated) lumber and white aluminum covers the exposed parts of the cross (work done by Renaissance Restoration, Inc. Galena, IL). Large letters were placed on the outside of parish hall. Dave Poole worked on choosing the right size and style of letters to complement our 19th century style buildings. The “Pester Fund” paid for both of these projects. According to Hauser Art Glass, Co.: Thirteen “Grisaille” style leaded (pure lead) stained glass windows are inspected, and found to be in poor structural condition. The bracing is loose, fatigued, brittle and deteriorating. Some glass is broken or cracked. The wood frames appear to be sound. Lois Schultz, Senior Warden, issues this notice: It is with much soul-searching & the deepest regret that we must lock the Church & Parish Hall buildings because we have been vandalized in the past months. Keys will be given to any active members of the church. Signed Lois Schulz, Bishop’s Warden. The Rev. James T. Nixon, Vicar from 1992-98, pictured here on the day of the Celebration of New Ministry in 1992. The Rev. Graham “Pete” Berry steps in as interim priest while Grace searches for its next Vicar. The next vicar is the Rev. James T. Nixon. He brings with him his wife Joan and children Katie and Matt, all living in the vicarage at 114 N. Pine St. Born in 1948, and ordained a priest in 1991, this is Nixon’s second call after serving in Humboldt, Tennessee as Priest-in-Charge for two years. After serving at Grace for six years, Nixon will go on to become Rector of St. Catherine’s Episcopal, Marietta, Georgia until his retirement in 2012. Nixon runs for bishop of Northern California in 2006. This first annual “Hanging of the Greens,” to decorate the church for the celebration of the birth of Jesus. Food, movie and a talent show follows. In this year, major work on the foundation occurs. The foundation wall is re-laid and church is raised and supported by steel beams under the supervision and hard work of George Cooke. Materials and labor are donated by Bill Sieczkowski. This leads to a remodeling of the undercroft basement, adding additional classrooms, a library and a meeting space. The asbestos cement board ceiling is removed from the undercroft, done free of charge by church member Michael Marcheschi. An antique hanging outdoor light fixture made of a base metal and brass, 33x15, c.1900, is purchased for $650 by David A. Walsh. This light fixture is placed outside of the bell tower in memory of David’s mother, Mrs. Helen Walsh. Also this year, the church’s first mission trip is organized by the Rev. Jim Nixon to a flood site in Alton, Illinois. Renovation of the undercroft and bell tower exterior light fixture were dedicated by the Rt. Rev. Frank T. Griswold and the Rev. Nixon. The Youth Group (E.Y.C.) of Grace New Lenox in the mid 1990s, pictured in the front with adult supervisors in the back. The Youth Group, or EYC, goes on its first mission trip in 1996 to South Dakota. Interior of narthex (bell tower) entrance is renovated. Solid red doors were replaced with glass doors which gave the sanctuary a more open view. Not everyone favored this change. Also this year there is a second mission trip, this time to West Virginia. 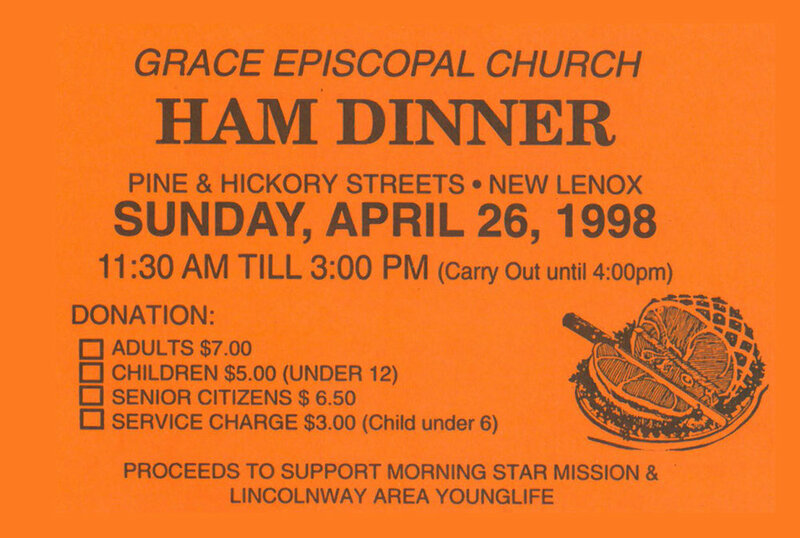 The last official Ham Dinner at Grace New Lenox is held two weeks after Easter. For many years it was a great time for fellowship and food and was a good fundraiser, but the burden of pulling it together has become too great. Jim Nixon leaves for Marietta, GA and the Rev. 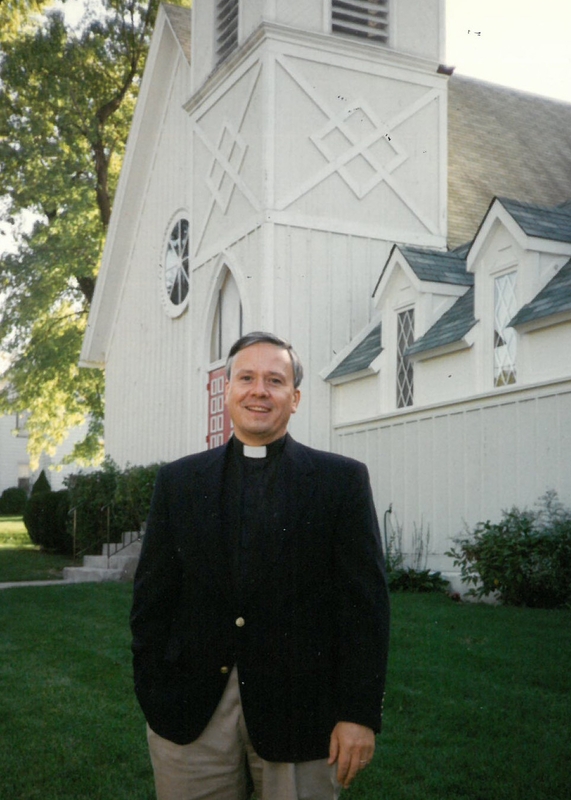 Jack L. Schauble serves as interim priest. The Search Committee was formed: Fred Hibbert, Dave Poole, Mike Russell, Lois Schulz, Tina Sherrow, Barb Sieczkowski, Steve Snyder, Bob Swale, Lyman Whitney, Brenda Carrier and Chair, Roger Whitehead. 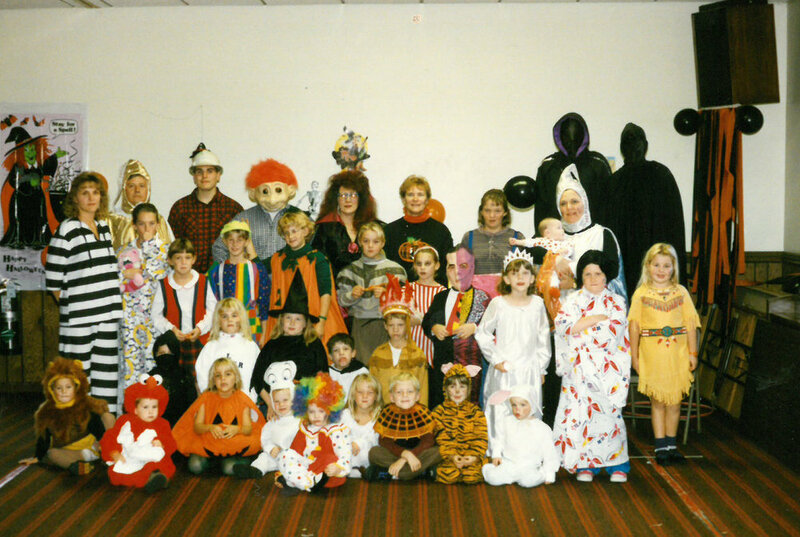 Grace Halloween Party in the Parish Hall, 1998. Parish Hall carpet replaced (orange carpet 10 years old). Outside of church and entrance to parish hall was painted. New floor installed in entrance to parish hall. Handicap ramp and landscaping added to outside of Church. Dedicated in memory of Lyman Whitney’s mother Lucy Whitney. A second Grace cookbook was published this year, (the first was in 1975). The Rev. Susan L. Sommer is called to Grace, becoming its first female priest and vicar. Sue and her family, husband Rick and daughter Cady, move in to the Vicarage at 114 N. Pine St. The Banner Guild begins life. The members are Deb Huddleston, Dianne Garrelts, Pam Bloom, Margo McDermed, Arleen Wobser and Paula Woods. On the day of these terrorists attacks on the United States, the Rev. Sue Sommer holds a Service of Evening Prayer at the church. A tabernacle is given to Grace by Miles and Rosella Snyder. It had been given originally by Rosella’s mother Olive, in memory of her husband, to St. Dunstan’s Episcopal Church in Westchester, IL. When St. Dunstan’s closed in 2001 the Snyders asked the Diocese for the tabernacle so they could give it to Grace. The front has a lamb on it and a side brass plate: Remember Before God Burton H. Hawkins 1890-1963. A tabernacle is a small cabinet designed to contain the Reserved Sacrament. The Sacristy and Vesting Rooms (rooms on both sides of the altar) are renovated by George Cooke. A pillar of the community dies: Mary J. Morris (1912-2002) is buried in Maple Wood Cemetery, New Lenox. The Paschal Candle is given by the Cooke Family in memory of Mary Morris, 1912-2002. A paschal candle is a very large candle in a very tall holder and placed in a prominent display. The candle is lighted throughout the Easter season, during baptisms, weddings and funerals. Dave Poole forms a Columbarium Committee after sending out a questionnaire to see if there was interest in having one; it shows many people of Grace are interested. In 1984, Dave Walsh and a committee had looked at Grace having an outdoor columbarium but the funds were not there to support one. George Cooke Sr. and Kevin Reeves remove historically inaccurate 1960’s paneled wainscoting from the nave and replace it with historically-accurate bead board wainscoting. Rita Travis begins as the first female deacon, and first staff-deacon at Grace. The Bishop from the “Old Catholic Church” comes to visit Grace: the Rt. Rev. Frederick J. Sansone. A building addition project entitled “Growing God’s Grace” is put on hold due to the departure of Sue Sommer. The plan was to expand westward off the back of the parish hall, and would have added 4000 square feet of education space. Parish office would have moved from the vicarage to the undercroft. The plans that were also abandoned this year included a new, larger sanctuary on the property. Vicarage, parish hall, undercroft and the outside of church are painted. Dorothy Cooke and Pam Bloom go to the BMO Harris Bank (formerly New Lenox State Bank) to see what was in our safe deposit box. Upon opening the box they find nothing in it! The safe deposit box was opened in 1995 by Vicar Rev. Jim Nixon, Dorothy Cooke and Mike Russell, both Vestry members. The First Annual Church Walk sponsored by New Lenox Area Historical Society for the Benefit of Schmuhl School Museum is held: tickets $10.00 for adults and $5.00 for children. Showcasing: Grace Episcopal Church., Living Streams Church, Marley Community Church, New Life Church, Peace Lutheran Church & United Methodist Church of New Lenox. The ordination to the Priesthood of the Rev. Rita Travis happens on this day. The Rt. Rev. Frederick J. Sansone, Old Catholic Church, presides and ordains. Assisting Priest is the Rev. Jim Caldwell, Grace’s supply priest. A LeHavree Healing Service is held at Grace. All denominations are welcomed. The Rev. Bridget K. Tierney begins as the next Vicar of Grace New Lenox, celebrating her first service with Grace on her birthday (New Year’s Eve).